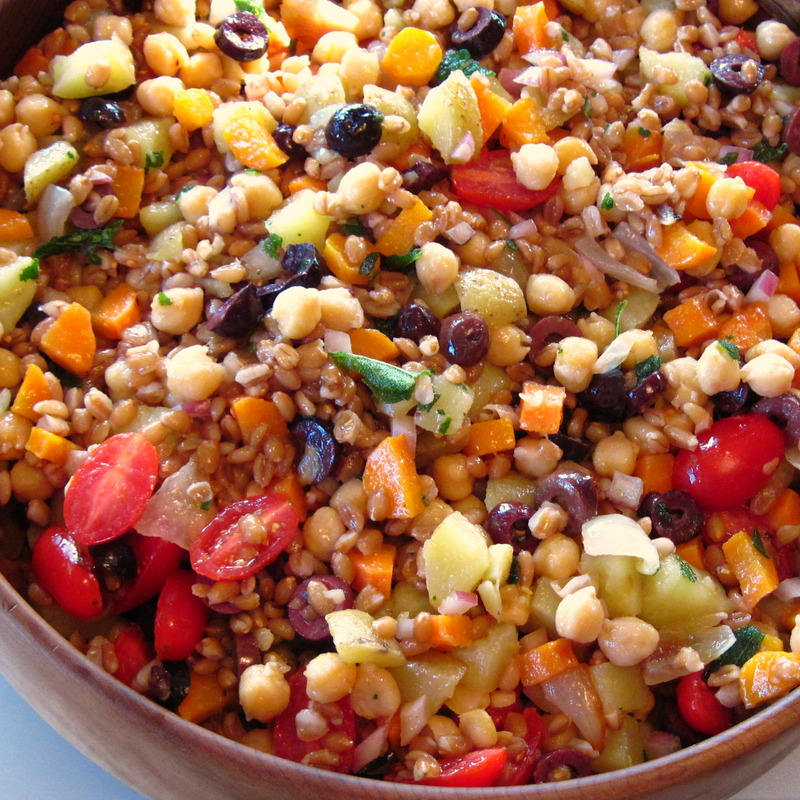 Farro and Chickpea Salad makes a colorful, flavorful and awesome side dish or vegetarian main dish salad. 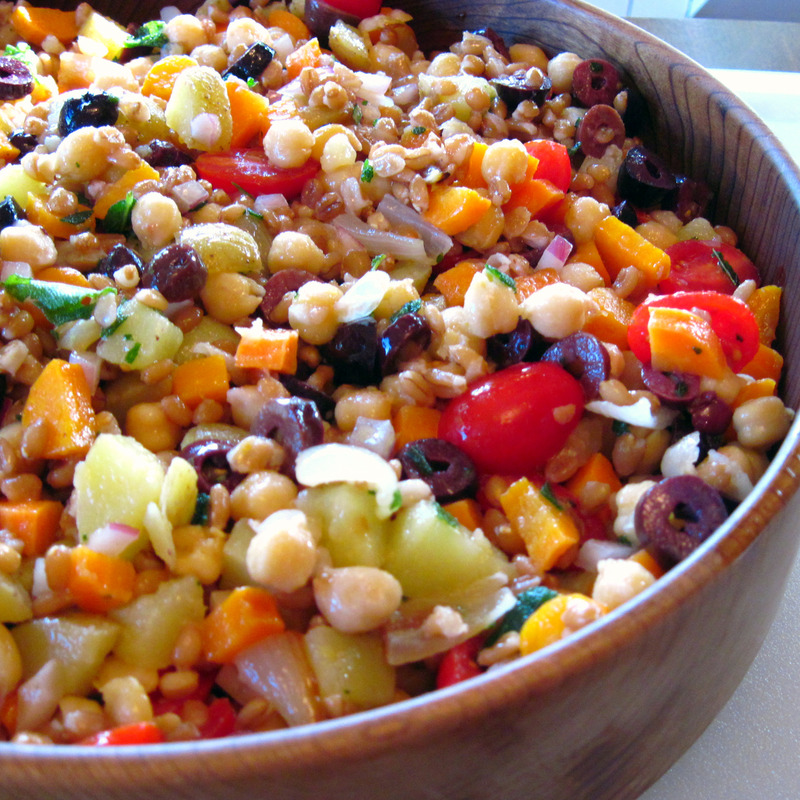 Make this when you want to “wow” everyone at your next barbecue or potluck get-together! I was inspired by the fabulous Organic Grain Salad served at Portage Bay Café, a great place for breakfast or lunch in Seattle. (It’s not open for dinner.) I ordered it because it sounded healthy (and good), but I was blown away by its deliciousness! I had to try to create my own version of it at home. It takes some time to prepare each of the individual parts of the salad, so it is not a quick recipe. But it is easy, and it is so worth the effort. 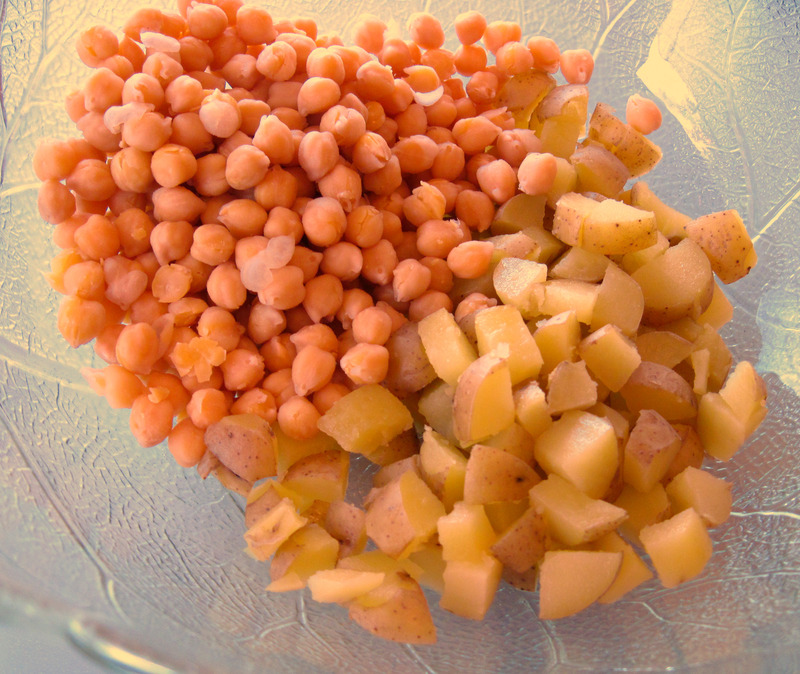 I cooked dried chickpeas (garbanzo beans), but a canned beans could be substituted. 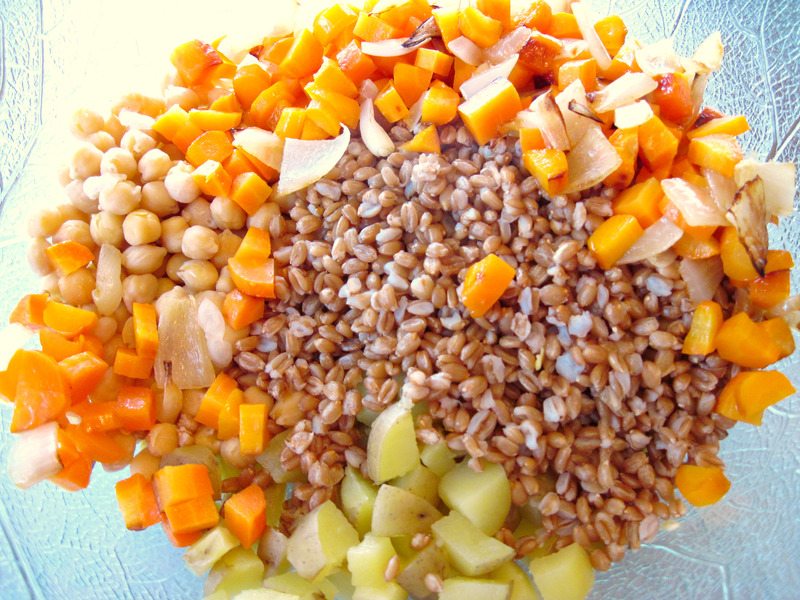 Wheat berries can be substituted for the farro, which can be difficult to find and is sometimes expensive. 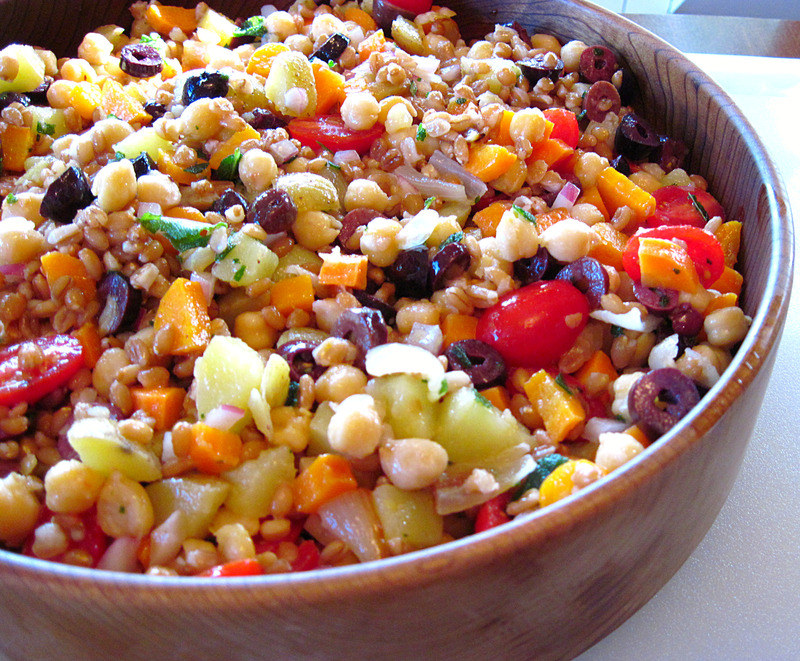 I have successfully made the salad with wheat berries; I found they are a bit chewier than the farro, but still very good. If you’re not serving a crowd, make it anyway. You will love having the leftover salad in your refrigerator! 1. If you’re cooking the chickpeas, start them first. Put 1 cup chickpeas in a large pot. Cover with water so there is at least 2 inches of water over the chickpeas. Bring to a boil and boil for 5 minutes. Remove from heat and let them sit, covered, for 1 hour. 2. Drain the beans and cover with plenty of water again. Bring to a boil and boil for 10 minutes. Lower the heat and simmer for 40 minutes. Add 1½ teaspoons salt and simmer until tender, 10–15 minutes more. Drain. 3. Start the farro (or wheat berries) after you get the chickpeas going for their second boil. Put the farro in a large pot with lots of water. Add ¼ teaspoon of salt and bring to a boil. Reduce heat and simmer, uncovered, until tender but chewy, about 60 minutes. Drain when done. 4. Steam the potatoes until just tender. Let them cool; cut into small pieces. 5. Heat the oven to 425˚. Put the carrots on a small rimmed baking pan and toss with about a tablespoon of oil. Roast for 15 minutes. Stir in the sweet onion pieces and roast for about another 10 minutes. 6. Cut the cooked carrots into small pieces. 7. Heat about ¼ inch of olive oil in a small saucepan. Make sure the sage is thoroughly dry so it doesn’t splatter. Add the sage leaves (in 2 batches if it’s too crowded) and cook for about 30 seconds. 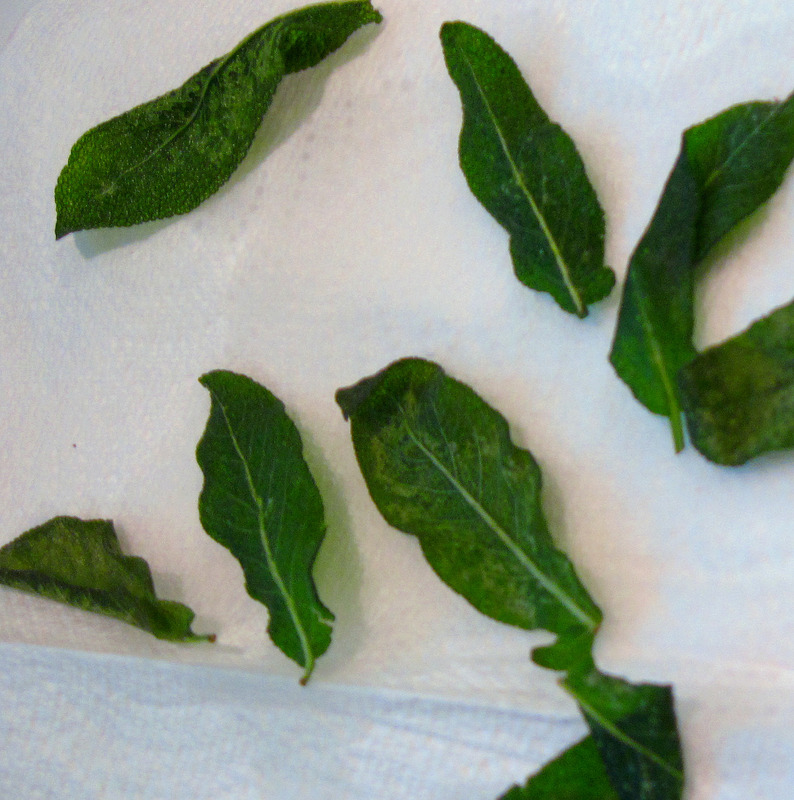 Remove the leaves and drain on a paper towel. After they have cooled off, they’ll be a bit crunchy. 8. 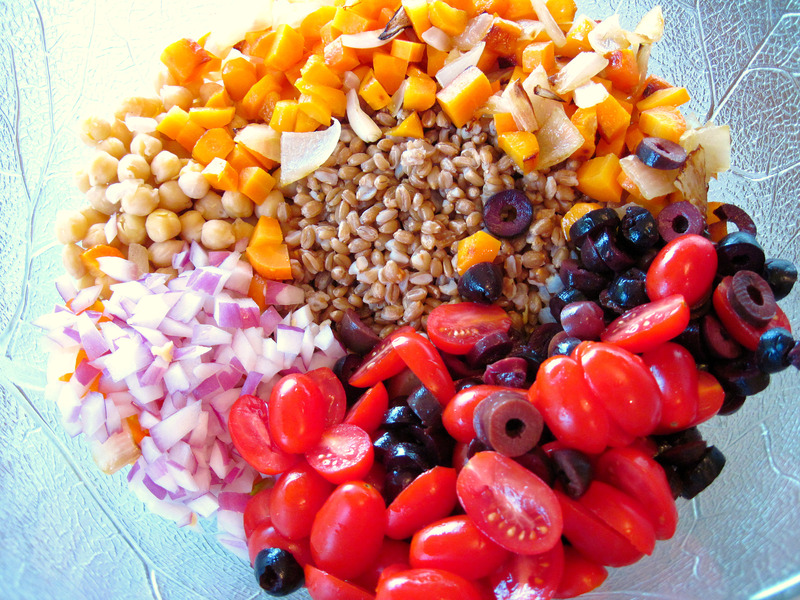 Add the tomatoes, olives, and the red onion to the other ingredients in the bowl. 9. Crumble the sage over the salad. Gently toss the salad with about ¾ of the Lemon/Rosemary Vinaigrette. Season to taste with salt. 10. Just before serving, taste, and toss with a bit of the extra vinaigrette if it needs more. 1. Mix the zest, salt, rosemary and juice. While whisking constantly, slowly add the oil in a stream until emulsion forms. I might have to make this for a BBQ on Saturday…it was just soooo dang tasty! Haha, “Farro” sounds oh so much better than “wheat berries”! This recipe sounds great! Thanks, Jennifer! It really is worth the 3 hours it took for me to put it together. oh my gosh ,that looks AMAZING!!! Thanks, Simply Life! It is even better than it looks; my photography doesn’t do it justice. I was obsessed with it after having it at Portage Bay Cafe. This looks like a really great and healthy side dish! This is perfect for how we’ve been trying to eat recently! I love the beautiful colors and textures. Great step by step photos and directions…wish I could get better at that! Thanks for sharing a dish you loved – and then recreated! Thanks so much for your kind words, DesignWineandDine! I find that getting acceptable photos is the greatest challenge, but I enjoy the whole creative process. I feel healthier just looking at that salad. Great job! Cooked this recipe as a side dish for 28 people Christmas Day… and was by far the biggest hit of the night! Really awesome combination of ingredients – and your pictures / instructions made it a very easy recipe to execute. Thanks for having this site! Have you tried other grains. I was thinking of using quinoa instead of farrow. What do you think? You really could use any grain here. My daughter made it with barley and it was delicious. I’m going to make it tonight. I’m catering an end of summer BBQ tomorrow for 40 guests. I’ll let you know how it comes out. Thanks! Is this a salad you eat warm or cold? Kelley, I think it’s best at room temperature.